Don’t just go for a boat ride. a wider variety of fish than any other charter in Kona. As a result, I’ve maintained the highest catch rate in Kona every year since 1997! Hawaii is one of the worlds top deep sea fishing destinations and it’s the geography of the Big island that makes Kona Hawaii the sportfishing capital of the Pacific. Five huge mountain masses protect the Kona coast from the winds resulting in sea conditions that are usually as calm as a lake. The steep slope of the ocean bottom puts the deep sea sportfishing within a short distance from the shoreline. Just three miles straight out of the harbor, it’s over 6000′ deep! Six species of billfish roam the Kona coast along with six species of tuna, mahi mahi (dorado), ono (wahoo), several species of shark and a wide variety of big-game bottom fish. With so many kinds of fish and fishing styles available, there’s little excuse for not catching fish. We caught a “Grander”! 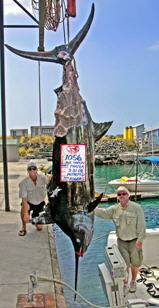 Even with some missing it weighed 1056 lbs. 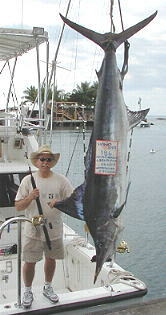 It took 17 years for a bigger black marlin to be caught. 843 lbs. We caught the biggest striped marlin of the Decade! 186 lbs. Whether you’re looking for that big trophy catch of a lifetime, some delicious fish to take home or just wanting to catch fish after fish after fish until your arms are too weak to haul in another, I’ll do my best to give you the best Hawaii fishing trip you’ve ever had! I offer a unique “hands-on” sportfishing experience. People who have some fishing experience will appreciate the fact that they get to be involved in the sport fishing process. On charter boats that use a deckhand, it’s the deckhand’s job to do everything on the deck. You’ll never get to touch the tackle except to (maybe) reel in a fish. Most people enjoy their fishing experience a lot more while learning the ropes and getting involved, turning your Kona Hawaii fishing trip into more of a contact sport and less of a spectator sport. I’ve been running single handed charters and teaching people how to big game fish for over two decades now so you don’t need prior experience to do this. Another thing that sets me apart from the rest of the Kona fishing fleet is the fact that I find “fishing” to be boring. Let’s go catching! “I consistently catch more fish, more often than any other charter in Kona because I use a wider variety of techniques and target a wider variety of fish so it’s usually not a matter of “if” we will catch anything but how many and how big. 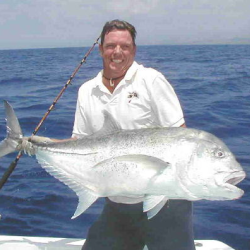 The typical Hawaii fishing charter will wander around the ocean all day trolling lures and hope for the best. The trolling bite is always in a state of flux so if the trolling bite is good and there’s enough action to keep things moving, then that’s what we do. If not, the bottom bite is almost always a guarantee of catching big fish. Using this combination of fishing techniques usually produces several fish and breaks up the monotony of just trolling all day.” You can always check out my fish photos page to see my recent catches.